After almost nine years of delay, the Court of Appeals for the Ninth Circuit mandates the agency to issue a decision. Chlorpyrifos, an organophosphate pesticide, is classified as a neurotoxin because it disrupts neurotransmission, essentially how brain cells communicate. According to the National Pesticide Information Center, it is also the active ingredient in dozens of commercial pesticides, used to control a wide range of insects on crops like corn, almonds, apples, and oranges. According to Dow AgroSciences, which manufactures the pesticide Dursban using chlorpyrifos, it has been used on more than 50 agricultural crops. Scientists’ neurodevelopmental concerns bolster efforts by the Pesticide Action Network (PAN) of North America and the Natural Resources Defense Council (NRDC)—which, in 2007, petitioned the U.S. Environmental Protection Agency (EPA) to ban chlorpyrifos on food. After eight years of “partial reports, missed deadlines, and vague promises of future action,” on August 10, the U.S. Court of Appeals for the Ninth Circuit made clear that the EPA must issue a full and final response to the petition by October 31. Here’s what you need to know in light of the agency’s pending decision. 2. Prenatal chlorpyrifos exposure has been linked to delayed brain development in children. It’s not just farmworkers who are at risk. 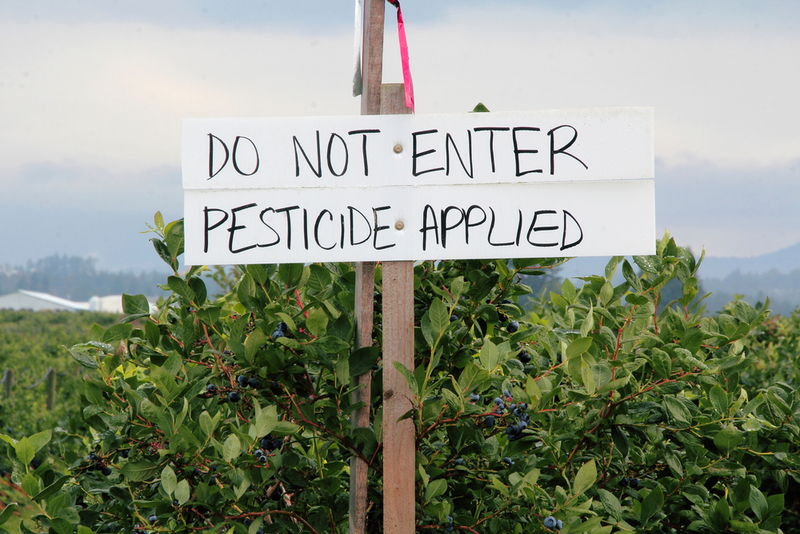 According to the Centers for Disease Control (CDC), once ingested, chlorpyrifos is metabolized into a form that is more toxic than the insecticide. The human body then metabolizes chlorpyrifos into a chemical called 3,5,6-trichloro-2-pyridinol (TCPy). California’s novel biomonitoring program found TCPy in 82 percent of 214 people sampled in 2012—including pregnant women. Then, last year, researchers demonstrated that pregnant women in California who were exposed to organophosphates, and specifically chlorpyrifos, during the second trimester, had up to a 60 percent increased risk for having children with autism spectrum disorders. But evidence of the chemical’s effects go back even further. Studies conducted as early as 2006, before EPA was first petitioned, compared inner-city children exposed to differing levels of chlorpyrifos, and found that higher exposure was linked to mental development delays, attention problems, attention-deficit/hyperactivity disorder, and pervasive developmental problems in three-year-olds. 3. The EPA has already banned chlorpyrifos near homes, schools, and gardens. Chlorpyrifos was eliminated from homes, schools, day care facilities, parks, hospitals, nursing homes, and malls—in 2000. But the EPA permitted continued use of chlorpyrifos in agricultural areas. “This pesticide was removed from home uses … because EPA recognized the dangers to children at that point, but the uses in agriculture were still allowed,” says Veena Singla, an NRDC staff scientist based in San Francisco, California. She points out that the EPA’s own assessment says that risks for farmworkers can’t be mitigated by anything short of stopping its use. The EPA’s revised human health risk assessment [PDF, see page 12], released last December, found some risks to farmworkers who mix and apply chlorpyrifos products to crops. The assessment also indicated that when chlorpyrifos is applied in high amounts in small watersheds, there are potential risks to drinking water. 4. Farmers all over the country continue to use it. According to the latest U.S. Geological Survey pesticide usage data, farmers used roughly half the chlorpyrifos in 2012 that they did in 1992. That said, over 5 million pounds were applied to orchards, grapes, soybeans, nut crops, corn, and alfalfa around the nation that year. Most of that was applied throughout the Upper Midwest, but California was the biggest single user at over 1 million pounds. It’s important to note, says Singla, that there are a wide range of alternatives to chlorpyrifos that many growers are already putting to use. Unfortunately, some of the alternatives available can impact a broader spectrum of organisms, and therefore even disrupt natural predators of crop pests, or have significantly higher costs. Last year, the University of California’s Integrated Pest Management team published a report that identified potential alternatives for use in alfalfa, almond, citrus, and cotton farms. 5. The EPA could still find a way to delay. The EPA ostensibly has three options: deny the petition for a ban, partially grant the ban (while working with industry to come up with a mitigation strategy that could circumvent a total ban), or grant the petition and revoke the tolerances. Thank you for this article. People have to wake up and realize they are poisoning themselves and their children and demand an end to it. Ban glyphosate and GMOs too!